Educational software systems are usually highly interactive systems that needs to be evaluated from two different perspectives, first as interactive software, mainly using usability and accessibility approaches, and second as an educational product that needs to be evaluated from its learning impact. The empirical evaluation methods may be quantitative, with a more deductive reasoning, or qualitative, with a more inductive reasoning, oriented, however mixed approaches have been used extensively because they combine the both main methods with a more pragmatic knowledge focusing on knowing the consequences or solving problems. The empirical evaluation of interactive educational software due to its own characteristics requires a mixed approach typically. 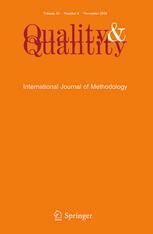 This special issue is devoted to identify, share and valorise best practices and experiences, with a very solid modelling background, that are focused on the empirical evaluation of educational interactive systems with a special emphasis on mixed quantitative and qualitative approaches. We also would like to encourage submissions of interdisciplinary work by authors from different areas. If authors have any questions regarding the suitability of their work for this special section, whether topical or methodological, they should not hesitate to contact the lead guest editor (fgarcia [at] usal.es.). General information and guidelines are available at the Journal web site: http://link.springer.com/journal/11135.